Ilium is a new comer to the epic heavy/power metal scene, hailing from the land down under, Australia. Sirens of the Styx is their debut album, and it serves as a very solid staring point for Ilium's career. Combining some of the finer elements of underground metal such as Manila Road, Attack, and Jack Starr with more familiar acts such as Iron Maiden, Ilium have come up with an intriguing sound that should attract some attention. Sirens of the Styx sounds like an album from established veterans of the metal scene rather than a debut album. The album contains thought provoking lyrics, avoiding all the dragon and battle clichés that all of us have heard time and time again. Ilium has no problem writing a 10 minute epic, flowing so naturally that the song is seemingly over in no time at all. There are 3 of these 10 minute epics on the album, each just as good as the other. Within each of these epic tracks, the band is able tell a story, with the music following a diverse path to suit the story at hand. Ilium have come up with some very interesting compositions for this album. Galloping riffs and some creative drum work form the backbone of the sound. Dual guitar harmonies are also prevalent throughout the album, my personal favorite aspect of the band's music. Ilium manages to display their technical skills without interfering with the integrity of the song itself. Getting back to my point about the compositions themselves, I enjoy the time changes and tempo changes within any given song that just have a natural and logical flow. While I find myself unable to predict what's going to happen next within a particular song, I don't find the result to be choppy or chaotic either. Each of the songs is concept based, or telling a story. As a story has a logical (although not necessarily predictable) flow, Ilium's music also has a logical and natural flow. The weak link in the band's otherwise outstanding music is the lead vocalist. I find that his delivery is too thin and nasal, with a limited range. He is also slightly off key in a few spots, but not painfully so. With the diverse emotions and moods that Ilium's epic metal contains, there is an extra demand on the lead vocalist to have a full bodied delivery and a decent range. I just don't feel that this fellow makes the cut on this album. Upon visiting the band's website, I found that Lord Tim of Dungeon will be singing on at least the second of third albums from Ilium. Fellow Dungeon band mate Steve Moore will take over behind the drum kit on the next album. The two guitar players (the meat of Ilium's sound, in my opinion) still remain in the band, so I am confident that these changes will benefit the band. 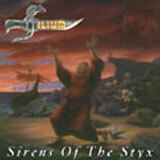 Sirens of the Styx is a truly promising debut album from Ilium. I would encourage any fan of epic heavy metal or underground metal such as the aforementioned bands to check out Ilium's website and learn more. With the numerous lineup changes, it's hard to predict where the band's sound will go from here. From what I have heard of Dungeon though, I expect the lead vocals on the next album to be much better. Combine that with the already superb music, and Ilium could deliver a knock out punch in the near future!